We are happy to share with you the 18th issue of “Struggles and Victories: Waste Pickers on the Frontline”. In this number, we have news from five different continents. Priyanka, volunteer at the Buguri community library, was a part of summer camp with children of Waste Pickers in Buguri, Bangalore. She tells her experience in the meeting at the Freedom Park on Friday, May 19th, 2017. The day was structured in two sessions with several workshops taking place in each: storytelling, crafts, theatre games, martial arts, and pottery to name a few. Once the kids settled down into their groups and facilitators, they became instantly engrossed and involved in the spirit of those sessions. The day ended with the important oath taking ceremony where the children committed that neither they nor their peers will drop out from school as well as sharing their thoughts about their experiences during the day. It was on June 7, 2001 that three thousand people took to the streets of the Esplanada dos Ministérios in Brasilia to claim their rights as collectors of recyclable materials. It was in the street, making a noise, that the seed was planted for the National Movement of Collectors of Recyclable Materials (MNCR) which struggles for a new, more just and sustainable world. Therefore, June 7th, the NATIONAL DAY OF STRUGGLE FOR COLLECTORS OF RECYCLABLE MATERIALS, is a day of national mobilization. Our goal of having our work be recognized and valued category is still far from reality. The municipalities and companies want to pay tribute and celebrate our professionalism, but few pay us correctly for the service we provide. The vast majority of our comrades are in the streets and in the dumps, without rights and hope. The Federación Argentina de Cartoneros, Carreros y Recicladores – CTEP placed the Tent of Cartonero´s Dignity in Plaza 25 de Mayo in Rosario. The measure will last from June 21st-23rd, 2017 and accompanies the draft ordinance ‘Public Service for the Recovery of Recyclable Waste’, which was presented this morning in the Deliberative Council. The draft ordinance proposes the creation of a Public Service for the integrated and differentiated management of recyclable solid waste and the inclusion of the urban waste pickers in its development. 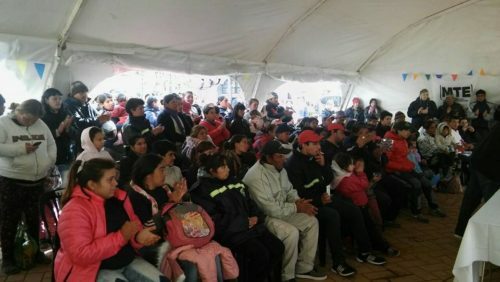 Among the activities that will be carried out are a panel on, “The situation of workers at the present time and their challenges”, as well as a workshop on zoonoses with veterinarians from the Federation of Cartoneros who discussed the work they perform daily with waste pickers in the province in order to ensure their horses are cared of for and healthy. 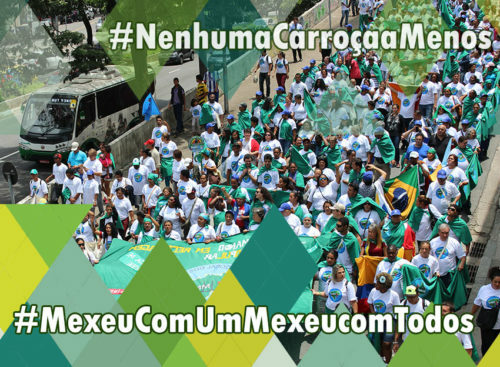 In addition, the Federation will present the following demands: Stop the police harassment and persecution of the cartoneros in different municipalities, hold a round table with the participation of all those involved done with the true intention of moving in a concrete and positive direction to resolve the conflict, and elaborate a plan of action to achieve a system of selective collection with social inclusion in all the municipalities of the province. The demand for actions to manage the large quantities of garbage produced by urban centers and the search for economic alternatives of families that have been dedicated to the recycling solid waste for years have driven the initiative to create 15 new cooperatives of grassroots recyclers in municipalities such as Nagarote, Jinotepe, Masaya, Diriamba, Nindiri, Chinandega, Granada, El viejo, Juigalpa, among others, in Nicaragua. The initiative to organize 15 new cooperatives is promoted by the Network of Nicaraguan Entrepreneurs of Recycling (REDNICA), and was one of the recommendations of the study “Socioeconomic Characterization and Health of Recyclers in Urban Centers, Main Landfills of all Departmental Capital Cities in Nicaragua 2013 – 2014”. 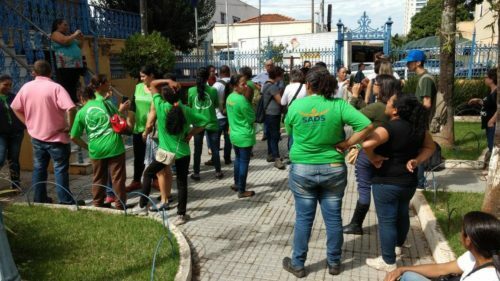 The Rafey Eco-park Recyclers Association denounced the unjustified imprisonment of Juan Rosario, President of the organization, and blamed Mayor Abel Martínez and officials of Cilpen Global Company (which has started operations at the landfill). This measure aims to portray the waste pickers’ association as a criminal entityin the public opinion and to thus remove 426 recyclers from he landfill, nullifying their rights. The municipalityremoved recyclers from the landfill, militarized it, and prevented the entry of any recycler to the landfill. 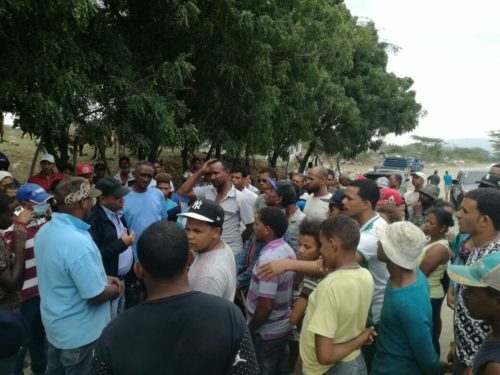 The Rafey Eco-park Recyclers Association has demanded the immediate release of the detainees, and has called Mayor Abel Martínez and the businessmann Neney Cabrera, to sit down and have a dialogue with the Association’s Executive to seek a negotiated solution to the conflict. 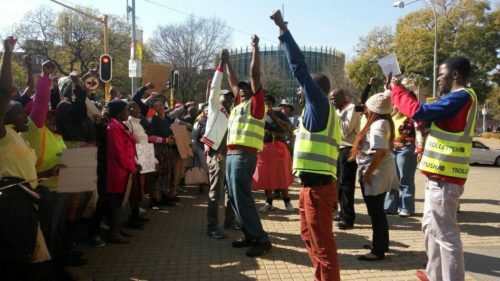 Reclaimers (waste pickers) from 7 regions of the City of Joburg (Johannesburg, South Africa) marched to protest a new source segregation program which could threaten their livelihoods. Waste pickers marched to the waste management service provider, Pikitup where Eva Mokoena presented a Memorandum of Demands to the Managing Director of Pikitup on behalf of the Interim Joburg Reclaimers Committee. See video of the protest in Facebook. See Johannesburg’s New Waste Programme Threatens Reclaimers’ Work for details. 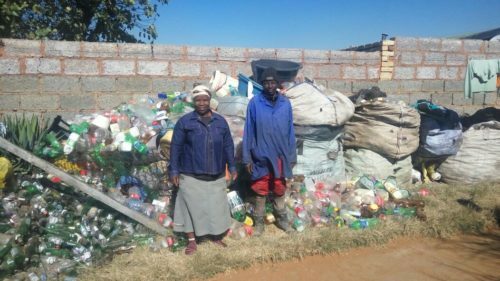 On July 1st, contracts signed by the City of Johannesburg’s Pikitup with private recycling companies will come into effect, threatening the livelihoods of hundreds of informal street reclaimers (waste pickers). This is despite appeals to Pikitup and the City since September last year to disclose and discuss these contracts with street reclaimers. Exclusion of waste pickers from the process of recycling runs counter to national government policy and contradicts commitments made by the City. Johannesburg’s waste pickers have no intention of letting the matter rest. They formulated a platform of demands and are planning to march to Pikitup and the Mayor´s office on July 10th, 2017 to submit it. 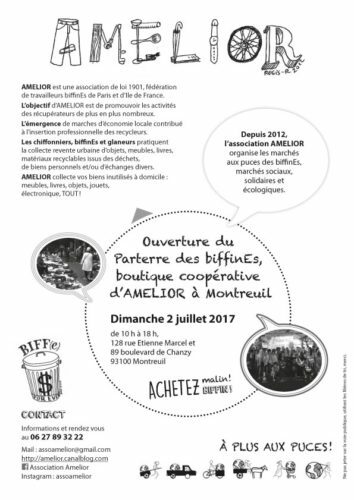 On July 2nd, the Association of Individual and Organized Local Economic Recycling (AMELIOR) hosted the grand opening of its cooperative shop, “Parterre des biffinEs”. Featuring a materials library, a clothing-by-the-kilo sale, and a flea market, there were also a number of workshops, on dismantling and reusing electric and electronic materials, repairing computers, crocheting with plastic bags, framing paintings, and welding and making bicycle carts. Those who went could also enjoy live music, food, and an exhibit of photos and drawings of waste pickers. June was a busy month in the social management of waste. We practiced our trade of recycling and adding value to waste and unsold items from yard sales, and in recovering unused items from homes. We hosted a meeting with the street vendors collective where we received knowledge and recommendations for joint actions. There was exploration and exchange with the public during a screening of the documentary film “Les Tribus de la recup” (The Recoverers’ Tribe). Organizers of the St. Blaise flea market – one of the largest markets in Paris – invited AMELIOR to bring its tools and know-how/expertise to its stand on dismantling electric and electronic material, during the celebration of recycling organized by REFER. We had our monthly flea market, attended by about 200 waste pickers from 46 districts, with thousands of buyers and sellers since March 2013. Our authorized sale booths of recuperated goods, featuring about 12 tons of recycled, often unique, products, are within everyone’s price range. It is this recognized work of recovering and reselling that has formalized sustainable recycling in Paris over many years. By recognizing our contribution to efficient waste management in terms of recycling, through basic and collective organization to create and sustain flea markets and popular economies, and by organizing based on the Right to the City and an economy for all, we are moving towards our goal: a place and a market for all; rights for all workers; and ZERO WASTE-ZERO POVERTY. The Quebec National Holiday, St. Jean Baptiste Day (June 19th), is a time of festivities that comes with a lot of consumption outside the home. To address this ecological issue, and to make life easier for everyone, especially retailers, the Valoristes Solidarity Cooperative opened a special depot to collect all recyclable containers that would otherwise cause the garbage cans to overflow. We also held a Facebook competition where followers were invited to guess how many containers they would collect! The cooperative runs a permanent depot, where any individual or company payment for the value of the containers that they return, without discrimination, without a limit on quantity, and in an efficient and welcoming environment. Our partners have long understood the need for establishing such a repository. As the City of Montreal mentions in its social inclusion strategy: we need a 375th Anniversary for all! For their long-standing support and vision, we would like to thank the City of Montreal, the Jacques Cartier and Champlain Bridges Inc., the Desjardins Credit Union, the Recycan Inc., the Borough Ville-Marie, Consignéco and RISQ.